This is how Mandy Evans described what it felt like to watch news clips of a Flight Nurse loading her 2-year old daughter into an air medical helicopter. It all started on April 19. The day seemed like any other for the Evans family. Mandy’s husband Patrick was at work, 2-year old Olivia was starting her day at pre-school, and Mandy was settling newborn Amelia down for her nap. Then the phone rang and the day took a drastic turn. “When I listened to the voicemail all I heard was, ‘Mandy, it’s an emergency.’ The school called me back while I was listening to the voicemail and they told me that Olivia had been bitten by a rattlesnake while out on a walk with her class,” Mandy recalls. At that point, adrenaline took over and Mandy sprang into action. After making panicked phone calls to her husband and her mother, she packed up the baby and sped off toward Olivia’s school. However, while she was in route, Olivia’s teacher called and told her that she needed to change course; Olivia was in an ambulance headed to Loma Linda University Medical Center. The REACH13/H165 aircraft in flight. “While I was driving, the school kept calling to give me updates,” says Mandy. “They told me she was in stable condition. I found out later that Olivia was actually in critical, but stable condition. I think they were purposefully leaving out the CRITICAL part because I was already in hysterics while driving. The next phone call I received was that she was being airlifted to the hospital. 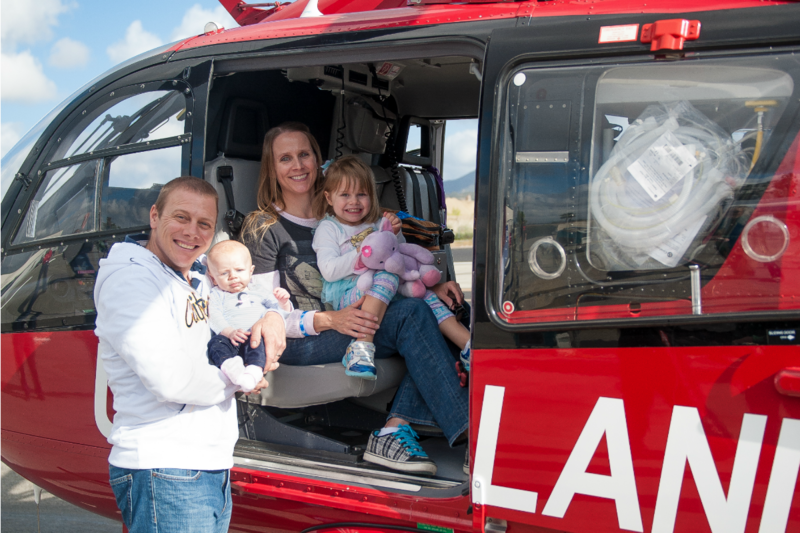 Now my baby was in a helicopter and probably so scared.” Because of the critical nature of a rattlesnake bite, Olivia needed to be flown to Loma Linda University Medical Center. The trek from Chino Hills to Loma Linda took Mandy over an hour. By the time she arrived in the emergency department, news footage of Olivia’s transport was hitting local airwaves. That is when the full events of the day started to become clear. 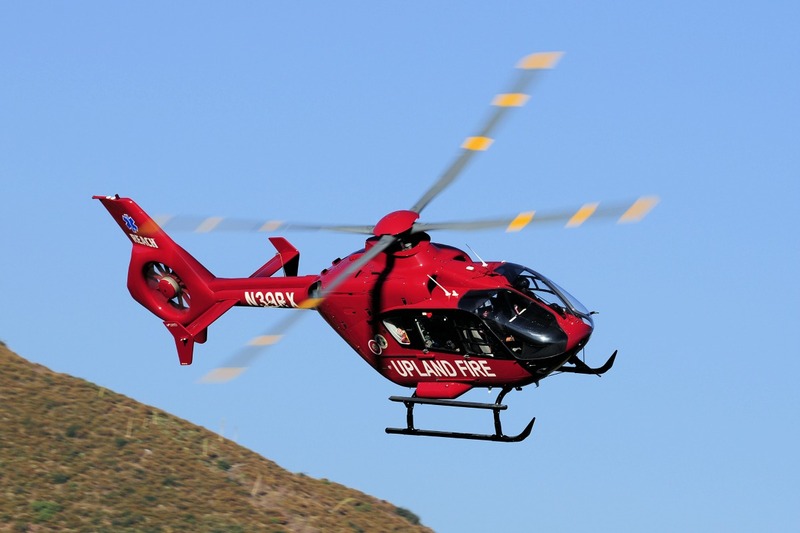 The news clips showed Olivia with the REACH 13/H165 medical crew from Upland, California. Pilot Gary Lacore was at the helm and with him were Flight Nurse Melanie Munns and Flight Paramedic Greg Lattimore. Gary has more than 40 years of experience as a pilot. From his years spent in the Army National Guard to his nearly 10 years flying for REACH, Gary has seen it all, but transporting children still hits a soft spot with him. Minutes after the call, Gary landed the aircraft with Melanie and Greg safely on the ground at Olivia’s school. After she was briefed on Olivia’s condition, Melanie began formulating a new plan for the transport. Normally for scene calls like this, the patient is placed onto a stretcher and then loaded into the rear of the aircraft. However, this was shaping up to be anything but a normal transport, and luckily for Olivia, Melanie is not your ordinary Flight Nurse. 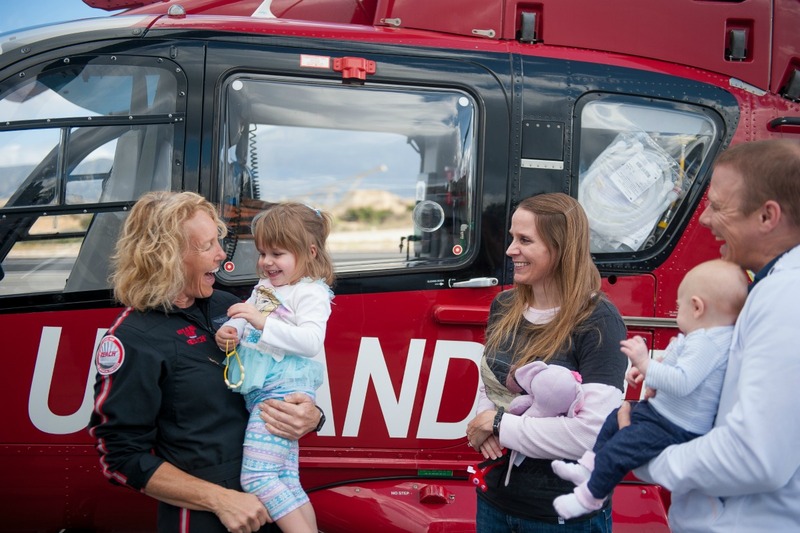 Flight Nurse Melanie Munns reunites with the Evans family. “I told the paramedics, ‘I’m just going to carry her and see if it’ll calm her down,’ they balked a little, but in the end, they just shrugged their shoulders and said ‘well, that’s what Mel wants to do,” chuckled Melanie. Melanie scooped Olivia up in her arms and prepared her for the trek out to the aircraft. Waiting for them was Flight Paramedic Greg Lattimore. Making his way to the side of the aircraft, Greg climbed in and waited for Melanie to hand Olivia over to him. After settling Olivia on the gurney, Greg did something even more unusual. He took Melanie’s seat in the aircraft just so that he could maintain eye contact with Olivia and keep her from feeling scared and alone. Rolling with the new seating arrangement, Melanie secured the aircraft and took her seat as the crew chief for the second half of the flight. From there, Gary took over and did what he does best. Meanwhile, Melanie and Greg focused their efforts on distracting Olivia and helping manage her pain. After touching down safely at the hospital, the crew accompanied Olivia down to the Emergency Department where she quickly became everyone’s favorite patient. The nurses at Loma Linda are phenomenal, but Melanie described them as absolute rock stars when it came to handling Olivia. Despite a happy reception in the ER, Olivia was not out of the woods yet. In total, this brave little girl needed 42 vials of anti-venom during her stay in the Pediatric Intensive Care Unit. She also suffered a slow release of neurotoxins, called a venom pocket, just as doctors thought she was in the clear. Nearly one week after her arrival at Loma Linda, Olivia was healthy enough to go home. Patrick and Mandy Evans are happy to have their little girl home again.